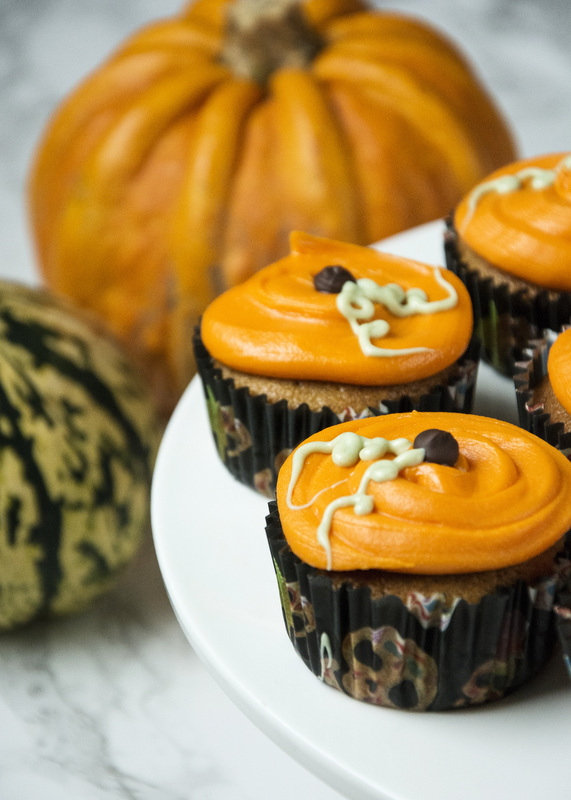 These adorable pumpkin cupcakes are decorated with cute little pumpkins all ready for your Halloween celebrations. It’s nearly here! Halloween is definitely one of the best holidays, pumpkin carving, fun costumes and of course themed baking! This year I’m not actually celebrating Halloween, I have a wedding that weekend so the celebrations have been halted for a year which is okay as I get to celebrate the marriage of a friend. 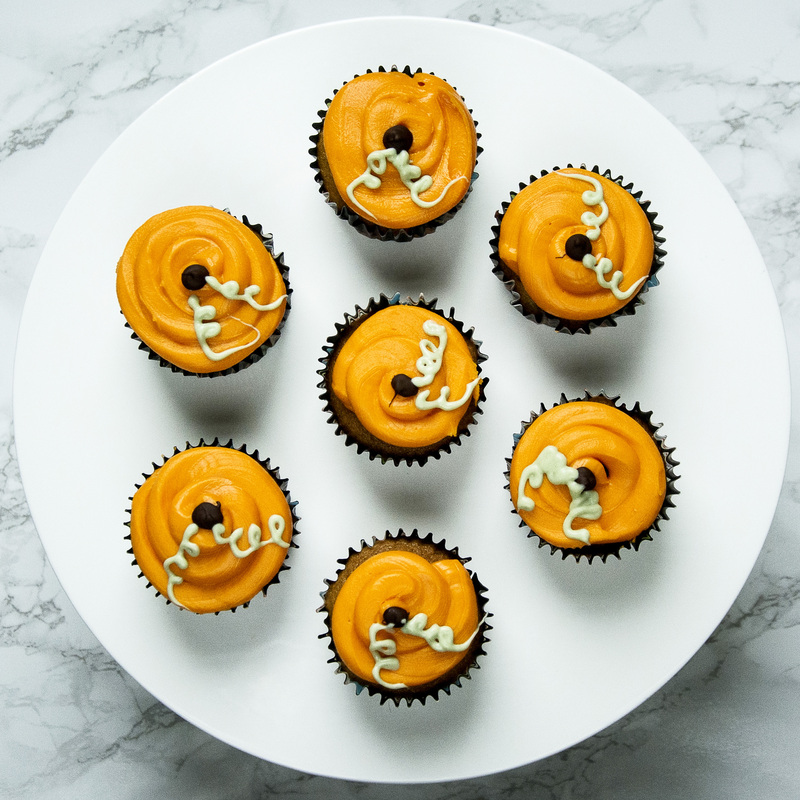 But if you’re hosting a Halloween party this year you should give these little pumpkin cupcakes a try! 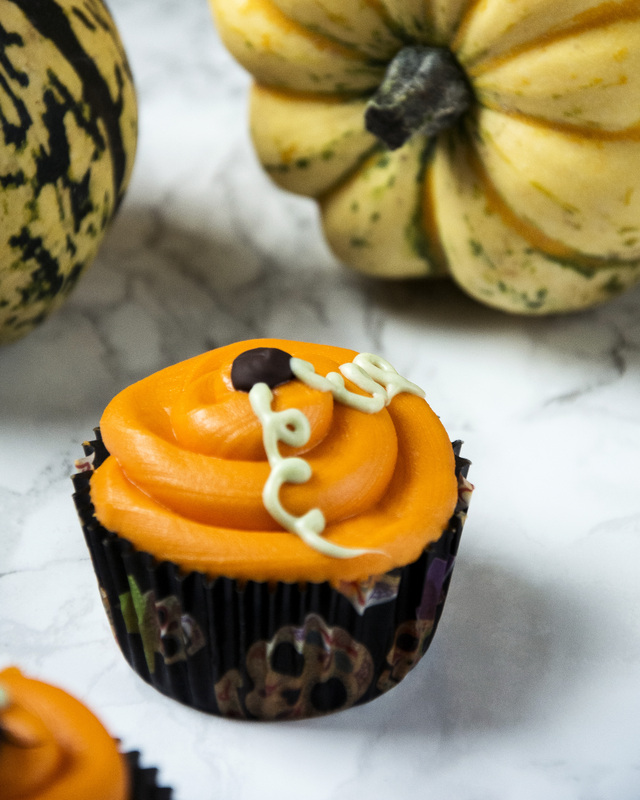 Pumpkin spiced, pumpkin cupcakes spiced with cinnamon, nutmeg, ginger and allspice, decorated with orange white chocolate ganache, your guests will love them! The pumpkin puree keeps the cake wonderfully moist. If you can’t get hold of canned pumpkin puree don’t worry, it’s really easy to make yourself. Just half a small pumpkin, remove the seeds and take off the peel. I find that a cheese slice is best to remove the skin but if you’re careful you can do this with a knife. Chop the pumpkin into small chunks and boil in a medium pan until soft. Mind took around half an hour, but the larger your pieces are the longer they will take to boil. Once boiled you can either throw them into a blender and puree or mash them really well with a potato masher. Keep your puree in the fridge until you need it. Pre-heat your oven to 190C / 375F. Line 2 x 12 piece muffin tray with cupcake cases. In a mixing bowl sieve together the flour, baking powder, bicarbonate of soda, salt and the spices and leave to one side for later. Using an electric whisk, beat together the butter and both sugars until the mixture is light and fluffy. Whisk in the eggs one at a time followed by a tablespoon of the flour mixture to prevent the batter splitting. With a wooden spoon, stir in the milk and the pumpkin puree. Fold in the flour mixture, folding until just incorporated, do not over fold as you will knock the air out of the mix. Divide the batter equally between the cupcake cases and bake for 25 minutes. After 25 minutes remove from the oven and leave to cool completely on a wire cooling rack. Turn the heat off and add the chocolate, stir the mixture a little but not too much. Now be patient and let the hot cream melt the chocolate. (If your chocolate doesn’t seem to be melting, its ok, transfer the mixture into a microwave proof bowl and give it 30 seconds on high, stirring well afterwards, keep giving it 30 seconds at a time until everything has melted. When the chocolate has melted, grab an electric whisk and give the whole mixture a good whisk. Cover the ganache in clingfilm and chill in the fridge for at least an hour, more if you can. After an hour, remove the ganache from the fridge and bring it to room temperature. If you cant wait give it another 30 seconds in the microwave. When the ganache is at room temperature it will be easier to pipe onto the cupcakes. It should be firm enough to pipe but not runny, and it shouldn’t be hard to squeeze through the piping bag. Separate the ganache into three bowls, two tablespoons of ganache into two of the bowls and the rest in the third. Squeeze a few drops of orange food colouring into the largest bowl of ganache and stir well with a spoon until the colour has evenly distributed. If the colour isn’t as vibrant as you would like, add more colouring and repeat. Colour the other two bowls, in the same way, one with green and the other brown. 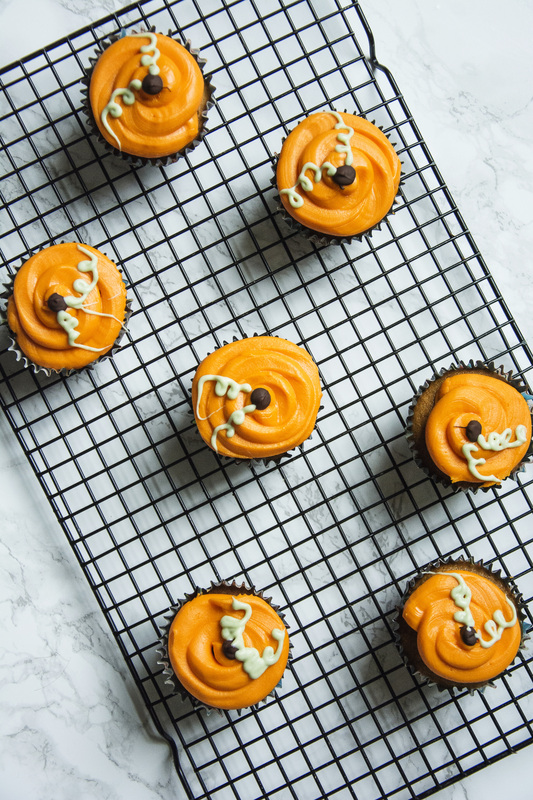 Transfer the orange ganache into a disposable piping bag fitted with a large round piping nozzle and pipe each cupcake with a swirl of icing starting in the middle and working your way out. Transfer the brown ganache to a piping bag fitted with a medium round piping nozzle. Pipe a small round of brown icing in the centre of the cupcake, this will be the pumpkins stalk. 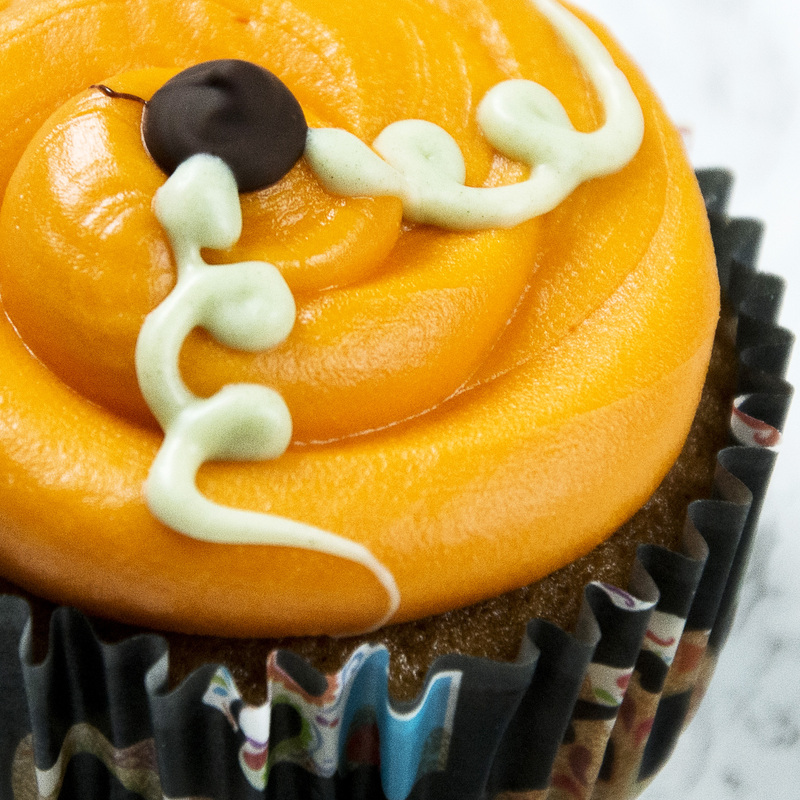 Transfer the green ganache to a piping bag fitted with a small round piping nozzle. Pipe the pumpkin leaves, starting at the base of the stem and working out. And there you have it, fun pumpkin cupcakes for Halloween. If you give these a try let me know how they turn out by tagging @whatseatingmanchester in your social media post. For more inspiring recipes don’t forget to check out the blog.